I cannot believe how time has been flying lately! On Monday I feel like the weekend will never come and then all of a sudden it is Friday; but then all too soon it is Monday again. A vicious cycle if you ask me!! I guess that is where all the time has gone and that is also how I am going to explain my lack of posts! October and November was full of outdoor fun, parties, family, work, and weddings! 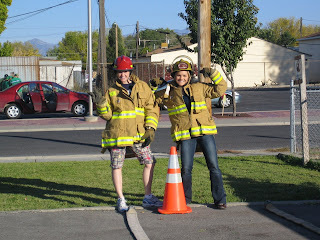 Quinn and I competed in "SLC: The Amazing Race". 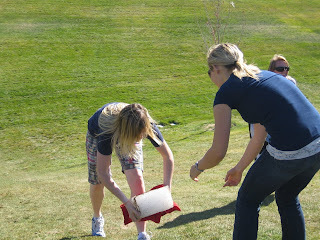 One of our teams tasks was ice blocking and another was a fireman's relay. We ran all over the valley completing various tasks at locations such as: Cabelas, Thanksgiving Point, Maverick, Kennecott Mine, and several parks. Team Quiet Riet (consisting of Quinn and I and our friends the Riley's) could not quite pull off first, but we did manage 4th place! 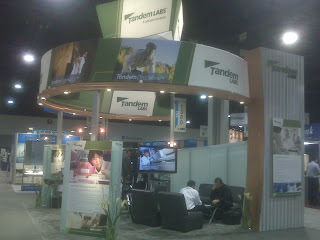 Tandem Labs (my employer) had a convention in San Diego that I put together, so I flew out there to make sure all went well. 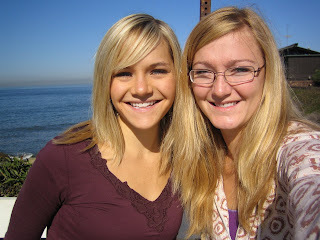 While I was there, I shared breakfast with a good friend from high school, Lindsay Hauser at a cafe on the beach! 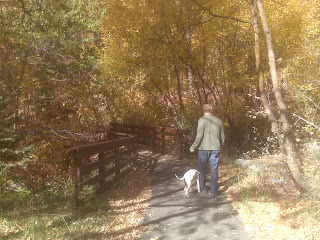 Quinn and I have really discovered MillCreek Canyon since we got Rylee. We have taken her up there several times and she LOVES every second of it. 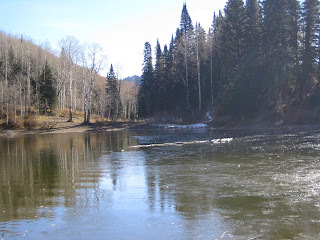 This is the view of Dog Lake up Millcreek canyon. 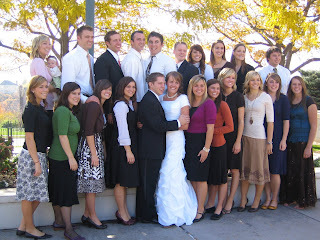 My cousin Natalie Nay got married in the Bountiful Temple! 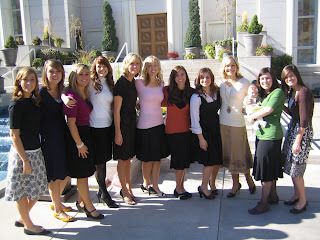 We were roomies at USU, so these are all our fellow USU Aggies!! It was amazing the amount of college friends were able to make it!! Most of us lived together at some point during our time at USU, so it was great to see everyone! 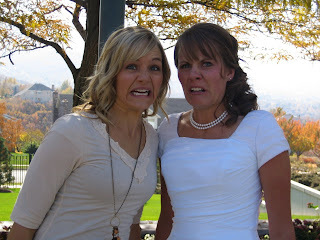 This is a very classic Linds/Natalie face...I think we were reacting to the fact, that yes, she really IS married!! 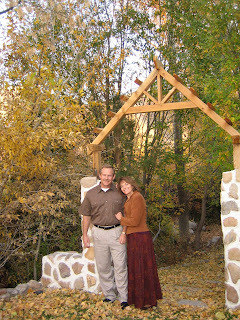 She had her reception at a beautiful home in Mapleton. 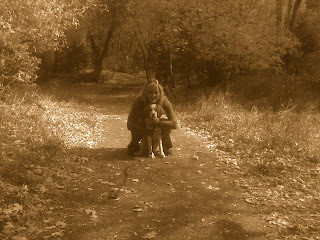 The back yard was so beautiful, Quinn and I had to take advantage! Mom and Dad drove out for the wedding! 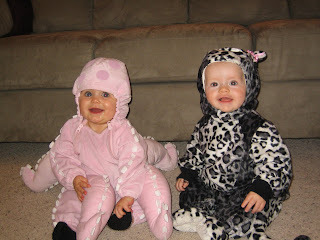 Now onto Halloween: The dinosaur is my nephew Tyler and the Octopus is my niece Reese. The little spider was a neighbor friend that came "Frick-O-Freating" (according to Tyler) with us! 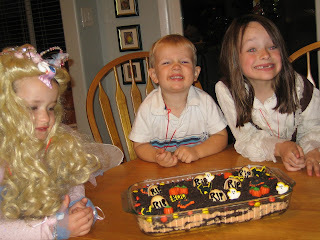 The Rappleye Sister's got together and had a post Halloween, Halloween party. 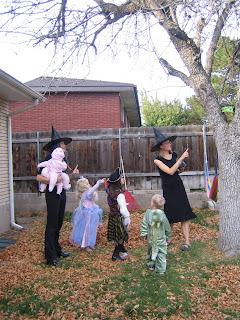 My sister Jen put together a scavenger hunt in the backyard. And of course...we played in the leaves. 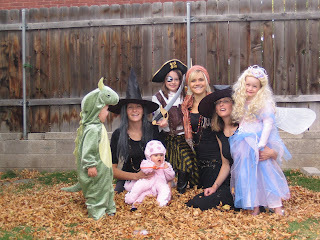 The pirate is my niece Andi and Odette (from Swan Lake) in my niece Afton. 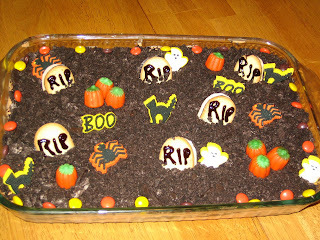 I made a festive graveyard cake for the occasion. This cake made me VERY popular with the nieces and nephew! This has to be the cutest picture of the night!! My two nieces, Reese (Kristi's girl) and Chloe (Jen's girl) are just two weeks apart They love to explore and have some much fun interacting with each other! You can only imagine how long it took to get these two smiling at the same time! 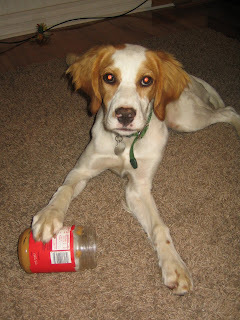 Quinn has recently introduced Rylee to peanut butter! If you want to keep her busy for an entire day; take a raw hide bone, slather it in peanut butter, freeze it...and viola you won't see her for the rest of the day! She is trying to get out every last bit of peanut butter here, we did not even try to take this away from her...it was way too entertaining! Lastly, Tandem Labs had a show in Atlanta...so off I went. 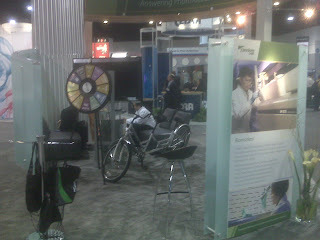 These are some pictures of the booth I put together for our company. I am sure Atlanta has a lot of great things to see...but most of what I saw was within the Atlanta Convention Center! 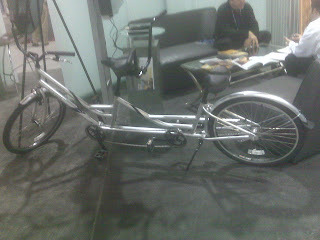 My favorite part had to have been the Tandem bike that we raffled off...it was VERY popular! This trip I also had the chance to sample some of Atlanta's fabulous restaurant's. If you ever need any suggestions in that city let me know; I feel like all we did was go from the convention center to a 5 course meal, back to the convention center, to another 5 course meal, to the hotel to sleep and do it all again the next day!! I don't normaly post things that bug me...but I had to share this one. 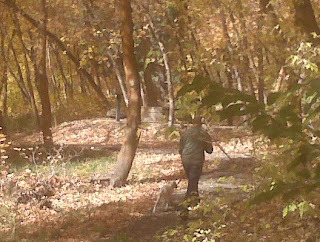 We live several miles away from Sugarhouse park. On my morning runs, I usually head in that direction, run around the park a few times and run back home. One morning in September, I noticed how dark it still was at 6 A.M. I started to worry about getting hit by cars, especially becuase it was only going to get darker in the mornings. 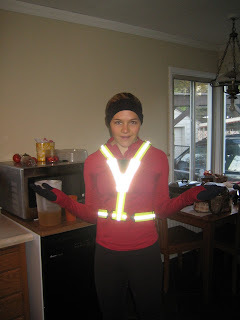 So, being the responsible runner that I am, I bought a reflective vest and started wearing it every morning on my run. I did not do this to look cool, becuase I am constantly dodging comments like "Oh! Capitan Safety...it is a good thing you're here, Rylee was just running with scissors!" from Quinn. I bought the vest to keep myself from getting hit by cars. Well, you will never guess what happens next! I GET HIT BY A CAR TWO TIMES IN TWO WEEKS and to top it off, it is the same stupid lady in her CRV booth times!! How can you not see this!!! 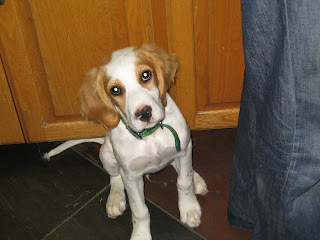 A New Edition to the Millet's!! Yep, that's right...Quinn and I have taken the next step in our lives, we have decided to grow our little family by one. 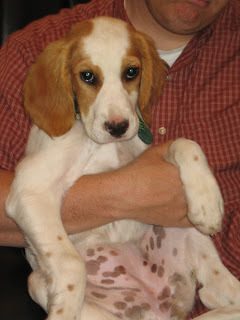 She is our sweet little English Setter. 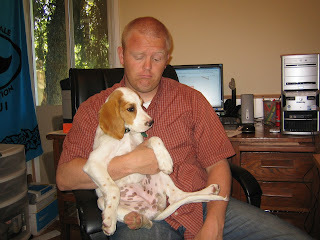 We bought her from a breader in Idaho and she was born on June 8th. 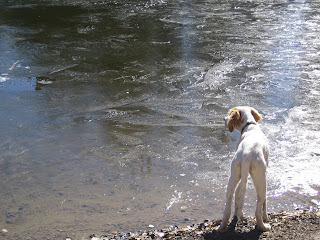 Second, to mingle with other dogs at dog lake. 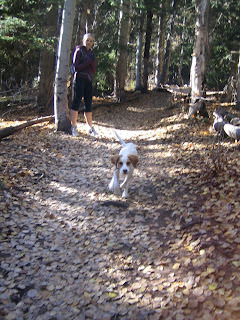 We ran into a couple dogs on the way up and she had such a great time playing around with them. She also loved not having to stay on her leash the entire time! Come by and visit on new little guy when you get a chance! 20/15 and lovin every minute! 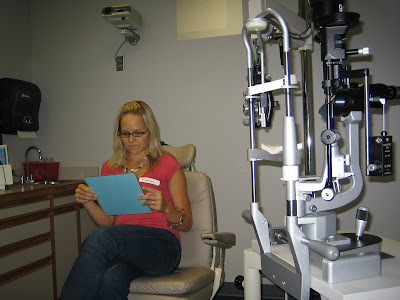 After they cut the cornea, they have you sit in a massage chair for 30 minutes with your eyes closed while your eyes adjust. 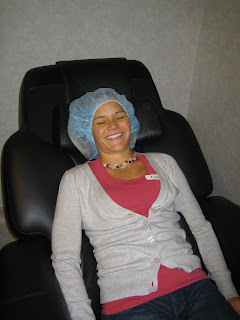 The whole time the chair is massaging and they bring fresh baked chocolate chip cookies!! 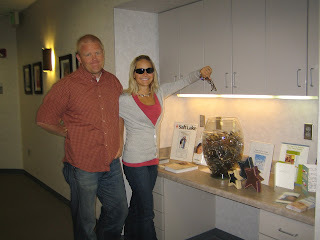 Here I am, with Quinn (my support the whole time), dropping my un-needed glasses in a donation bin. Who needs glasses when you can see 20/15!!!! Joel this is for you! 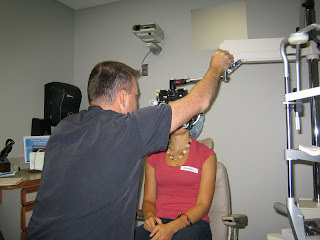 I will post details about the trip soon, but here are pictures! Yeah...Quinn found a lizard in a slot canyon and adopted it for a few days. Croc (as he was so named) actually stayed on his arm through an entire movie and overnight! 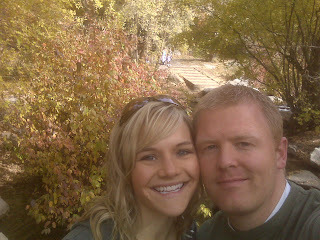 And who would have guessed... that this amazing couple would get engaged only a week after we left Powell. Congrats Natalie Nay and Brian Sanders!! We spent a lot of our time wakeboarding and tubing out on the lake. 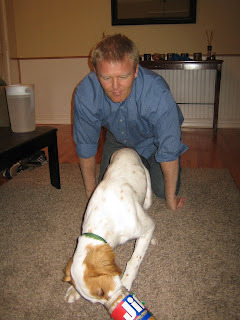 Here is a little slide show of all our Powell pics (a lot of wake boaring ones of Quinn and I). On our flight home from our trip to Boston, we decided to extend our 1 hour layover in Chicago, to a 6 hour layover so that Quinn could show me his childhood stompin' grounds. His family moved to Utah from Chicago when he was 12 and he has not been back to visit since. 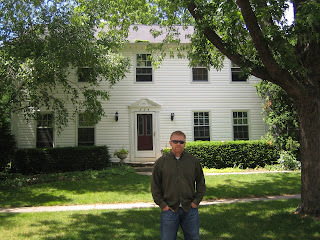 He was so excited to visit his old house, elementary school, and swimming pool in the cute little city of Geneva, IL. The day was filled of stories and memories of Quinn's childhood. 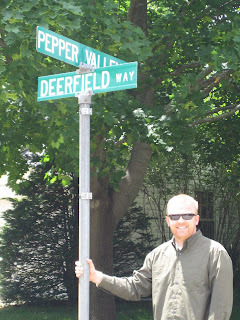 It was fun to see where he grew up and to hear all of his stories as he walked me around to each place. Quinn posing in front of the steet sign that he and his brother Abe tied a neighbor kid to so that they could see how long it took him to untie himself. 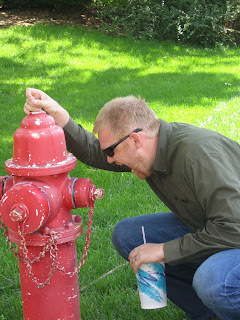 This is the fire hydrant that Quinn knocked his teeth out on when he went over the handlebars of his bike. The big white house on DeerField Way, lots of fond memories in that place.